Do your research to find a reputable Hair Restoration Clinic. A good clinic will avoid high pressure sales pitches. Each treatment has advantages and drawbacks. Please come in for a private consultation to help determine which of our solutions suits your lifestyle. If you choose the Hair restoration surgery option, the next step is to determine whether the donor area in the back of your head is large enough to cover the areas that you want to enhance. Once we have established that there is, indeed, enough hair available, we will next consult with you on a date. Once a date has been set, and a deposit ($500 – $1000) has been received, pre-op instructions will be given to you. On the day of the surgery, have a good breakfast as your next chance to eat will likely be at lunchtime. You will meet the team, the doctor will go over your medical history, then we will start by freezing the donor area. Short strips of hair will be surgically removed, which will then be diced into follicular units by our technicians. Meanwhile, the doctor will close the donor area with small sutures. 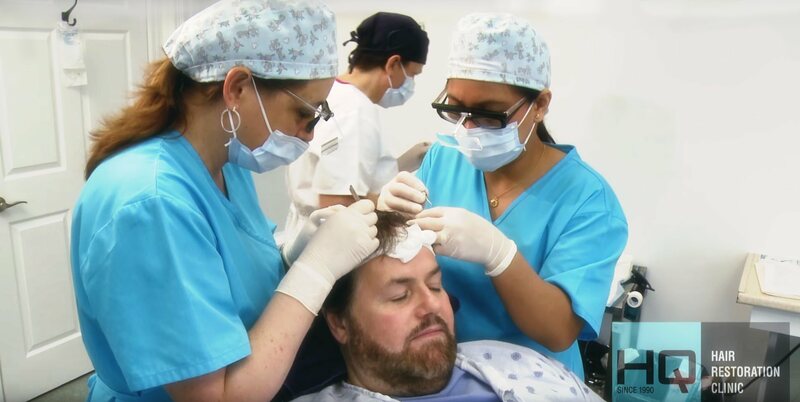 Next, he areas of hair loss which you want covered and, which have been discussed during earlier consultations will be frozen and recipient sites for the new follicles are prepared. After a restorative break for lunch, the technicians will begin to plant the previously removed grafts. Once the last of the new hair is planted, a procedure which can last a few hours, you will receive post-operative instructions before being sent home. If you live close by, we will ask you to come into the clinic for your first shampoo on day 4. After twelve days, the stiches will be removed. At this stage the doctor will usually recommend medical treatment for the new hair as well as a course of medicinal treatment, such as Propecia, to prevent further hair loss. Please keep in mind that we will always be here to offer advice and support. Come in to chat or to get your hair cut. We pride ourselves on our long lasting relationship with our clientele. For more information, please see our questions and answers section.